Atlantis Dive Video Slot Guide & Review - Casino Answers! Atlantis Dice is a 5-reel, 20-line video slot developed by CTXM, featuring a wild symbol, scatter wins, two symbol combinations and a free spins feature. You can play the Atlantis Dive at Bovada Casino. 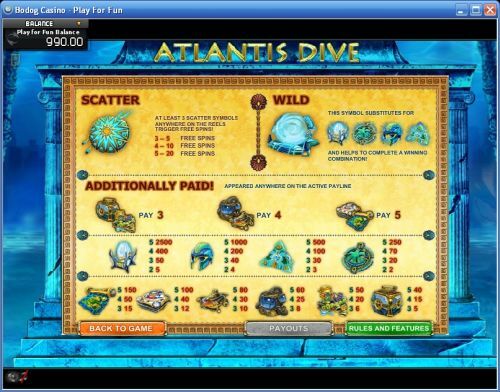 Atlantis Dive is an underwater exploration themed video slot. Most of the symbols are treasures that you can only find in the mythical Atlantis. Other symbols include a Map, Submarine and a Diving Helmet. Music will play whenever you spin the reels on Atlantis Dive. Sound effects play whenever you hit a winning combination. 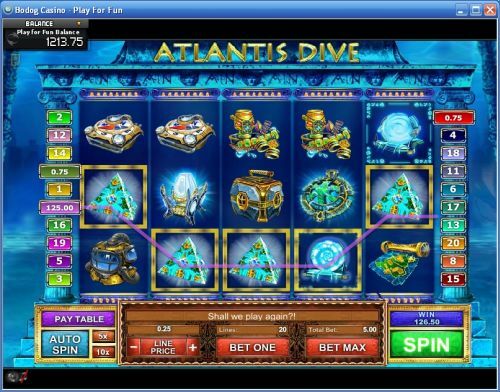 For a look at the Atlantis Dive CTXM slot game, a screenshot is below. Use the “+” and “-” symbols next to “Line Price” to set your bet. Coin values available on Atlantis Dive are $0.05, $0.10, $0.25, $0.50, $1, $2 and $5 per line. You can select from 1-20 paylines. Atlantis Dive slot machine is a nickel slot, so you can play anywhere from a nickel on a spin up to $100 per spin. To select the number of paylines you want to play, use the “Bet One” button. To play all 20 paylines, press the “Bet Max” button. For all other wagers on the Atlantis Dive video slot, hit the “Spin” button. The top jackpot on the Atlantis Dive symbol will pay out 2500 coins for 5 of a Kind of the top symbol. The second highest payout is 1000 coins. Other winning combinations in Atlantis Dive require two different symbols (total). The Atlantis Dive wild symbol only substitutes for four other symbols in the Atlantis Dive slot game. It doesn’t substitute for the two symbol combinations. When 3, 4 or 5 Atlantis Dive scatter symbols anywhere on the reels will trigger 5, 10 or 20 free spins respectively. Free spins feature wins are added to payline wins. You can re-trigger the free spins feature. Atlantis Dive has scatter wins, although they are not listed in the paytable. Use the Atlantis Dive free spins feature to win lots of cash when you play at Bovada Casino! Payouts are made according to the Paytable. Payline wins are multiplied by the bet per line. All symbols pay left to right. Coinciding wins on different active paylines are added. Free spins feature wins are added to payline wins. More free spins can be won while the free spins feature is activated. Only the highest win is paid on each of the active paylines. For a look at the complete payout schedule, a screenshot of the Atlantis Dive paytable is below. You can play 5 or 10 autoplay spins on the Atlantis Dive online slot. You can also hit the “Auto Spin” button to play more autoplay spins. You can play 5, 10, 20, 50 or 100 autoplay spins. You can stop the autoplay mode on Atlantis Dive by hitting the “Stop” button or clicking anywhere on the screen. If you’re interested in the treasures of the mythical Atlantis, you may want to give the Atlantis Dive video slot a few spins. Other than that, there’s nothing special on Atlantis Dive. There are many superior CTXM slots that you can play. If you want to try the Atlantis Dive video slot, sign up and deposit at Bovada Casino. Can I play a Flash game of the Atlantis Dive video slot for free? Yes, you can play a Flash game of Atlantis Dive at Bovada Casino. You can play for free or for real money. If you have any problems with the Instant Play Flash casino, make sure you have the latest version of Adobe Flash Player. Are USA players able to play the Atlantis Dive slot game for real money? Yes, American players are welcome to play the Atlantis Dive slot machine at CTXM online casinos such as Bovada Casino.